The second day of Disney got off to a slow start as we all slept in until 8:00 or later. Nearly 11 hours of sleep for all of us! 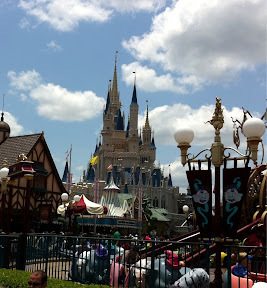 We visited the Magic Kingdom again to hit the spots we missed the day before. 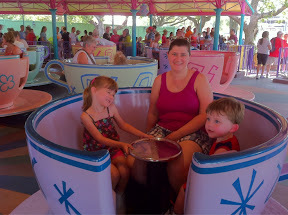 we rode the notable rides like the Tea Cups and Dumbo (more on that later) and we tried some new attractions such as Mickey's Philharmonic and the Winnie the Pooh ride. Those two "new" rides deserve some ire. I guess it's just a Disney thing but what is with all of the peril on their rides and in their movies? There were some legitimately scary scenes in the Philharmonic show that made both a 4 and 2 year old cry. At least warn us it's coming! Next the Winnie the Pooh ride. That's right Winnie... The... Pooh... Was scary. That takes some effort right? On the ride there were a few scenes where it looked and sounded like a tornado was coming through. Then toss on a few scenes where everything was flooding. Mix that together and we have another set of crying kids. 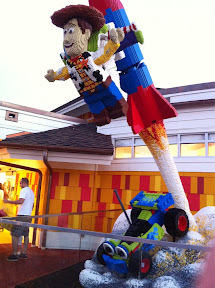 The only redeeming quality of those rides were the Fast Passes. Fast passes are Disney's way of getting people to maximize their time in the park. You can show up early for a ride grab a ticket and come back later. When it's your turn to ride you come back and are placed at the front of the line a godsend for those with kids who can't handle lines on hot days. Cue the Dumbo ride. 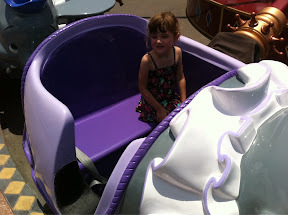 The one ride Alyce wanted more than any other was the Dumbo ride. It's a pretty short ride. You get in, you go in circles, you go up, you go down, and you're done. The problem is that the ride holds at best 20 people a shot and there is no Fast Pass for one of the most popular rides in the park. Mom and I steeled ourselves for the suffering that was to come from the 45 minute line, in the sun, and on a 95 degree day. Things go well for the first half but the second half is when the wheels fell off the bus. Any rational thought Luke had went out the window. He'd start running into other people, laying down on the ground, and pretty much ignored or did the opposite of what we'd ask of him. 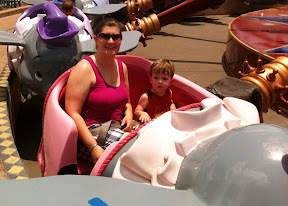 By the time we got on Dumbo we were done and so were the kids. Speaking of lunch Mom and I were kind of surprised. With the kid's meals they came by default with grapes and carrot sticks instead of fries. Even more surprising? The kids ate them and left our fries alone! They did however eat our dessert. To finish up on Dumbo I have to give Alyce a gold star. She handled herself very well in line and enjoyed the ride. Only when she's past tired, extra hot, or super hungry does she step out of line. You can't ask for much better. Looking back on it I don't blame Luke for flipping out. It was just too hot for too long for a two year old. If the weather were nicer or he was older we would have had a different result. Sorry little guy. Following the Magic Kingdom and a nap we went out to dinner at Downtown Disney. At the recommendation of the Disney Reservation person I talked to on the phone we tried the Raglan Road Irish Pub and Restaurant. I'd say his recommendation was right on. 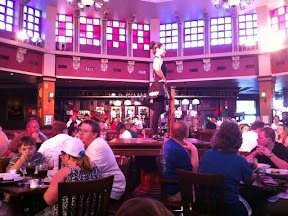 We had front row seats to live music and Irish dancing. The music was a bit loud but they were on break for most of our meal and the dancing kept the kids entertained. Mom had a chicken salad for dinner and I had a seafood chowder. Seriously, when did we get so old? In hindsight I should have stayed away from the seafood as I'd never eaten half of the stuff in it. Who knows if I would have been allergic to some unknown shellfish. Following dinner we stayed out waaayy too late shopping. I got a cool Lego set, Luke got two Mickey Mouse dolls, Alyce got a Cinderella doll and pink Minnie Mouse ears, and Mom got a set of Minnie Mouse ears. By the time we got the kids to bed that night it was pushing 11:30. They passed out from exhaustion but we knew we were going to pay for it the next day. Cue the ominous music. 0 comments on "Disney World Day: 2"